Delaware County’s Senior Medical Advisor will literally be making rounds to various communities in a giant, colorful Wellness van, delivering a healthy dose of preventive health care information to residents. Dr. George Avetian and Delaware County Council are partnering with Independence Blue Cross to launch a Wellness on Wheels initiative where he will visit libraries, senior centers and other community facilities to present information on a wide variety of public health topics. Called “Ask the Doctor,” the program is part of the county’s overall effort to educate residents about various public health issues from vaccinations to healthy lifestyles. Are there natural ways to reduce high blood pressure? Those are just a few of the most commonly asked medical questions when people talk to a medical expert. The popularity of TV shows such as “Dr. Oz” shows that people have many medical questions that aren’t medical emergencies, but they welcome the opportunity to pose them to a medical expert. Dr. Avetian said he can discuss a specific topic chosen by the group, or he can answer questions people have about topics from West Nile Virus and Lyme disease to stroke prevention and flu vaccinations. Inside the van is a wealth of information on health issues, plus interactive technology that lets people access on-line health tools and healthy lifestyle programs. 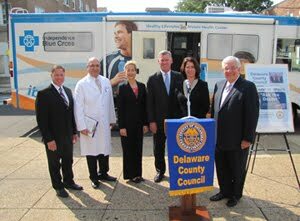 The Independence Blue Cross (IBC) van is being made available to County Council and Dr. Avetian through a partnership with IBC. “People are sure to notice this huge, colorful van and we hope that people’s fun and interactive experience with the van and Dr. Avetian will serve as a reminder to pay attention to their health,” Mrs. Morrone said. He said that people need to prepare for each doctor’s visit with a list of questions, medications, tests, follow-up instructions and other important information. He stressed that a visit to the Wellness van is not a substitute for a visit to their primary physician or health center. In fact, there have been situations when the Wellness van staff members have advised people to immediately see their physician. “This really gives new meaning to the term ‘house call,’” Dr. Avetian added. The IBC Wellness van was launched in 2005 and has since visited hundreds of workplaces, community centers and neighborhoods. Community groups interested in having a visit from Dr. Avetian and the Wellness van can contact the County Department of Intercommunity Health at 610-891-5311.